March 17, 2013 – Kim Kardashian Baby Bump Fake – Faking Pregnancy? Few months before Beyonce gave birth to baby blue Ivy carter, gossips claim she is carrying a fake pregnancy. Reality TV show Kim Kardashian is now on the list of celebrities likely to be faking their baby bump. 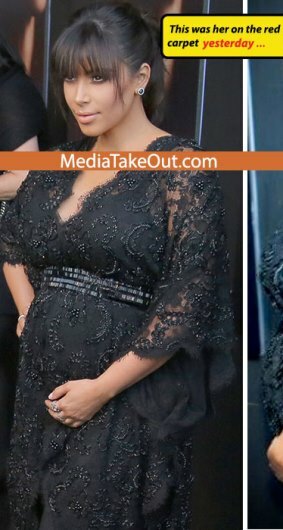 According to MediaTake, Kim Kardashian’s baby bump might be fake. They claim she might be wearing prosthetic belly..
Is Kim Kardashian’s pregnancy fake?